Studio Line: Universal Studios - The last neighborhood in America. Academy Award winning writer/director Oliver Stone brings shock radio to the screen in this relentlessly fast-paced suspense thriller. Dallas talk radio host Barry Champlain (Eric Bogosian) discovers one weekend that his skills in pushing people's buttons have won him a chance for national syndication. But instead of celebrating, he subjects his ex-wife (Ellen Greene) and co-workers to a darkly comic marathon bout of compulsive risk-taking with his unstable radio audience. Barry and his "fans" - the lonely, the angry and the dangerous - know that talk is not cheap, and words can kill. DVD: Wide 1.85:1/16x9; audio English Dolby Surround; subtitles Spanish, French; closed-captioned; single sided - single layered; 18 chapters; rated R; 109 min. ; $26.98; street date 10/31/00. Supplements: Production Notes; Cast and Filmmakers. One of Oliver Stone’s minor films, 1988’s Talk Radio also is one of his least personal works, at least after he made it big with 1986’s Oscar-winning Platoon. This movie provided Stone’s picture of the Vietnam War, a conflict in which he fought and one that strongly affected him for obvious reasons. Stone followed that with Wall Street, another personal flick, though for less obvious reasons. For one, Stone’s dad was a life-long broker, and his influence pervaded the project. It also provides Stone’s take on the era’s lack of soul. Both Platoon and WS came from Stone’s own ideas and scripts; he had a co-writer for WS, but it was still fully his baby. That clearly wasn’t the case for Talk Radio. If anything, this was the first time Stone felt like a hired hand. The project started as a play by Eric Bogosian, who also starred in that production and in this movie. Stone co-wrote the screenplay with Bogosian, but it still seems less like a Stone production than a staging of Bogosian’s work. The movie features little plot. Bogosian plays Barry Champlain, a radio talk show host in Dallas. He specializes in outrageous material that goads and provokes his listeners. Not surprisingly, his technique causes a lot of consternation among some folks, and Barry gets more than his share of threats. For the most part, the film just depicts a few days in Barry’s life. This period is made more unusual due to a couple of events. For one, Barry’s show is picked up for syndication, and the movie covers that experience and its effects. Also, Barry’s ex-wife Ellen (Ellen Greene) comes to town, a visit that stirs up some apparently-dormant emotions, none of which help matters with Barry’s producer and current girlfriend Laura (Laura Hope). That’s all the story you’re going to get, as the movie’s progress is essentially propelled by the tension between Barry and his listeners. Flashback sequences briefly depict Barry’s rise to fame, and also show the disintegration of his marriage, but most of the film sticks with the present tense. The film feels like a ticking time bomb, as the ever-present threats of Barry’s listeners continue to bubble. Will they eventually erupt? I won’t say, since that would be a spoiler, but I felt this sense of tension was the film’s main weakness. TR is a character drama with only the most artificial tension. I felt the movie would have worked better without the issues related to the listeners. Those elements made it feel like some sort of horror movie, where we constantly waited for the monster to jump out of the closet. As such, the tension subverted any attention that could have been paid to the characters. We get very little sense of what makes Barry tick, and even less focus falls on the supporting characters. The movie rarely leaves Barry to look at others, so even when we view them, it’s within the context of their relationships with Barry. This makes for an ultimately shallow experience, and not a terribly interesting one. Talk Radio seems to think it’s some sort of expose about the crazy world of radio talk shows, but it provides no depth in regard to that experience. Instead, it substitutes a drab look at one obnoxious loud-mouth and his screwed-up relationships. When Stone sinks his teeth into a project, it’s usually interesting; despite all of his many flaws as a filmmaker, Stone is rarely dull. 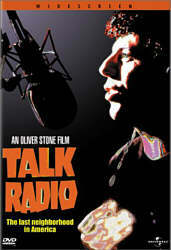 Unfortunately, Talk Radio quickly becomes tedious and inert, and it stands as one of Stone’s weakest films. Talk Radio appears in an aspect ratio of approximately 1.85:1 on this single-sided, single-layered DVD; the image has been enhanced for 16X9 televisions. TR suffered from some of the blandness typical of Eighties movies - a factor that also affected Stone’s Wall Street - but as a whole it seemed watchable. Sharpness consistently looked crisp and detailed. Despite many low-light interior shots, virtually no instances of softness occur, and the picture remained accurate and well-defined at all times. Jagged edges presented a few concerns, and I also detected some moiré effects from objects like blinds. Print flaws were modest but apparent nonetheless. I saw white speckles, grit, and a little grain, but nothing more severe cropped up during the film. Colors came across as drab but decent. The film betrayed a fairly brownish tone, and the hues could seem a bit muddled. Skin tones were somewhat flat as well. Nonetheless, the colors generally seemed acceptably accurate. Black levels were also a little weak, though they appeared fairly deep, and shadow detail appeared somewhat heavy and murky at times. As a whole, the problems were not significant, however, and many of them resulted from the dimly-shot scenes; the movie seemed fairly accurate for the most part. Somewhat better was the Dolby Surround 2.0 soundtrack of Talk Radio. The soundfield stuck mainly to the forward channels, which displayed nice breadth to music and effects. The side speakers provided nice ambiance and created a positive little atmosphere. The surrounds reinforced the score and also added some general effects at times. All in all, the soundfield wasn’t tremendously involving but it served the material appropriately. Audio quality sounded dated but decent. Dialogue appeared acceptably distinct and natural, with no signs of edginess or problems related to intelligibility. Effects were somewhat thin at times, but they came across as relatively clean and accurate without any distortion. Music fared best. The score offered some fairly solid bass and seemed nicely clear and bright. Ultimately, the soundtrack would have scored a little higher, but some tape hiss was apparent throughout the movie; that flaw detracted from the presentation. Nonetheless, Talk Radio presented a fairly good auditory experience for its age. Although most of Stone’s films now exist as nice special editions, Talk Radio isn’t one of them. The DVD includes some short but interesting “Production Notes”. These provide a decent look at the history of the production and the play upon which the film was based. We also find “Cast and Filmmakers”, which offers brief but fairly informative listings for actors Bogosian, Alec Baldwin, Ellen Greene, Leslie Hope, John C. McGinley, John Pankow, Michael Wincott, and director Stone. That’s a weak collection of extras for a weak movie. Talk Radio isn’t a total dud, but it’s a surprisingly bland and uncompelling effort from Oliver Stone. The movie offers a lot of bluster but little substance and ultimately seems unsatisfying. The DVD provides good but unspectacular picture and sound plus almost no supplements. Leave this one for Stone completists; it’s neither interesting nor provocative enough to merit most folks’ attention. Note: The version of Talk Radio reviewed here appears in the 10-DVD Oliver Stone Collection package; it cannot be found in the 6-DVD set. However, the film can be purchased on its own in a release from Universal; that DVD and this one differ only in the style of packaging they use. The OSC edition comes in a snapper case that reads “Oliver Stone Collection” at the top.